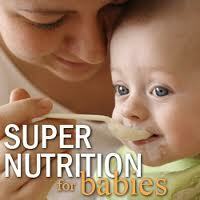 I just watched a great webinar entitled Super Nutrition for Babies. It was recorded by Dr. Katherine Erlich and is a mini introduction to her book of the same title. It's 22 minutes long and PACKED with great information for feeding young kids and really anyone. Click under the picture to go directly to the webinar.